Living in China for six years has allowed me to observe many cultural differences between China and my home country, the US. I've recently been intrigued and curious about the delivery drivers who call before knocking on your door. 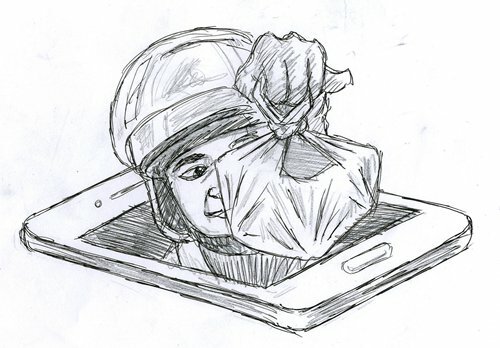 Have you ordered waimai (food delivery) or even ordered a Didi and a few minutes later, the driver calls your phone to let you know he is coming? This phenomenon baffles me, so I thought I would investigate to see why the drivers call first, instead of knocking on your door. Maybe it's just the custom here. Perhaps he's trying to make very little noise in case you have a sleeping baby. Or maybe he's calling to hear which direction the ringing is coming from, so he knows which side of the apartment building you are located. Whatever the reasons, it's safe to say it's entirely the opposite in the US. In America, if you order delivery, the driver will show up at your house, knock on your door and deliver your food. He won't call your phone unless you don't answer the door or there is some problem, such as he can't find your house or the doorbell is out of service. In other words, calling is the last option. However, in China, the delivery driver to calls right when he's outside the door as if there wasn't a better way to let me know he's arrived! Of course, with my poor Chinese, I can't understand what he's saying, but I think he's saying something along the lines of 'Your food is here'. This doesn't just happen every now and then, it happens 100 percent of the time. So it's led me to wonder, is that the custom in China? Sometimes, when the driver calls, I won't even answer the phone, I'll go straight to the door to open it, and sure enough - he's waiting right outside with my food, never attempting to knock. The driver may think that I am a fool for not answering my phone and he can't understand why. Or could it be a policy with deliveries, that they call first to warn you they are arriving, to be polite? I haven't found a confirmed answer. But it's not just with food delivery! It's the same with Didi. A soon as I order a ride, the driver calls to let me know he's on the way. Even though I can see his exact location through the GPS on the app, he still calls to let me know where he is. Whereas in the US, the driver only calls after he's arrived if he can't find you. Again, calling seems to be the last resort in the US, where it's the first point of contact in China. Living here long enough has allowed me to embrace and celebrate these cultural differences and to remember that it's not one culture doing it right or wrong, it's that both have their reasoning for why they do things a certain way. This is what I love the most about living in a foreign country - finding these little quirks and writing about them!